If Congress failed to act, the militia of the several states would be independent and able to organize as the Commander-in-Chief of the several states saw best. Not the best way to fight with joint formations, but if the Congress failed to act, there wouldn't be much opportunity to fight with another state (against one, perhaps - hence the war of southern intransigence). Interesting to compare a similar historical situation - e.g. how in the mid-1700s the government of Pennsylvania refused to defend the lives of it's citizens (vis a vis conflict with Native Americans). Benjamin Franklin stepped in, and a volunteer militia was formed - see his Form of Association for Defense. Think neighborhood watch on steroids (and with guns). "Congress has provided by statute that in addition to its National Guard, a State may provide and maintain at its own expense a defense force that is exempt from being drafted into the Armed Forces of the United States. See 32 U.S.C. 109(c). As long as that provision remains in effect, there is no basis for an argument that the federal statutory scheme deprives Minnesota of any constitutional entitlement to a separate militia of its own. 25 [496 U.S. 334, 353]"
He seems to suggest that states have a "...constitutional entitlement to a separate militia..."
Along with the 1747 Form of Association that RKV has referred to, Ben Franklin published remarks on each section of his proposed plan. These were designed to explain the idea behind individuals associating for defense. While it was preferable for everyone engaged in organized defense to have arms exactly alike, the arms they already had would work very well. Franklin clearly stated that most everyone had a firearm of one kind or another already in his hands at that time. It was the fact that individuals possessed their own arms and could defend themselves that made associating or self-embodying for organized defense possible. For those interested in more information on colonial defensive associations, including those spontaneously formed at the beginning of the American Revolution, read my definitive history of the Second Amendment, The Founders' View of the Right to Bear Arms. It traces every phrase and term of the Second Amendment back to their original AMERICAN uses and authors. Congress is not empowered to decide WHO is in the Militia. The clauses relating to the Militia provide no such authority. However, IF it were true that Congress could define the Militia then Congress would hold like power to define/determine EVERY word of the Constitution and the Constitution would be a wholly worthless and useless document. IF one allows that Congress can set limits to membership as was done with the Militia Act, then IF Congress were to make the Militia everyone under age 4 or over age 80, that too would have to be accepted. Congress may organize, i.e. take what is there and organize it, but Congress may not decide membership. 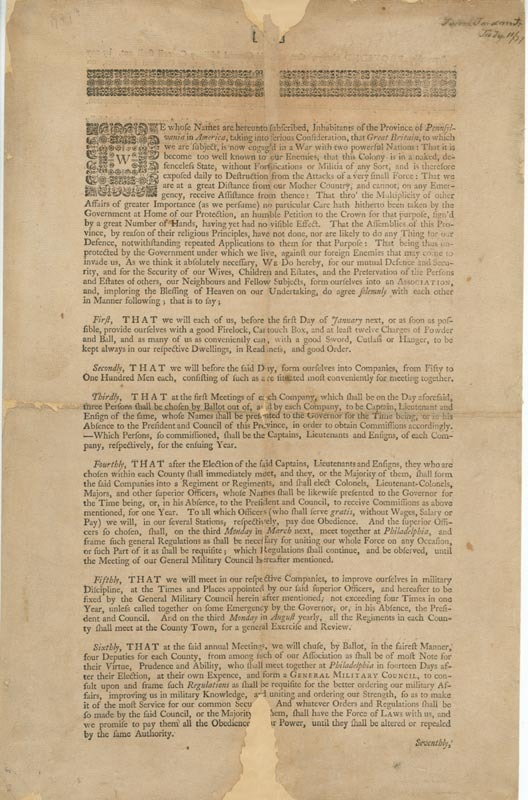 The wording of the clauses recognize the pre-existence of the Militia. Congress may take ALL persons capable of bearing arms as the Militia was known to emcompass and provide for organizing, etc. Having a Select militia, such as the National Guard, was defeated thrice during the Constitutional Convention. The Framers wanted no part of a restricted, select Militia instead focusing on Militia as understood to the People NOT to what the governmment might desire. This information is available in the documents from the Constitutional Convention. "Congress is not empowered to decide WHO is in the Militia." The founders certainly thought otherwise - see The Militia Act of 1792, which doesn't define the militia in a way significantly different than current law (see 10 USC 311 and 313 for comparison). That said, the 2nd protects a right of the people, not a right of the militia (which, if the militia is properly understood, is a subset of the whole [i.e. the people]). Further, can you (FWB) point to any case law that supports your contention? And David, thanks for what you do. Interesting question, David. The Court decided in _Maryland v. U.S._ that the state Guards are the "militia". On the other hand, it ruled in _Perpich_ that the National Guard system is an exercise of Congress's army powers. When the Nat. Guard system was created, JAG S.T. Ansell wrote in 1917 in the Yale Law Journal that he couldn't figure out whether the Nat. Guard system was an exercise of militia or army powers. Also, the National Guard system is built on a funding mandate. The states technically do not have to participate; they are free to opt out, at the cost of losing federal funding. Congress has not explicitly preempted the states, according to a Cal. court in _Holmes v. California National Guard_. According to the Californa court, this means that Cal. has the power to enroll homosexuals in the state Guard, and also the obligation to do so under state law, at the risk of losing federal funding. This suggests that other states could do the same with other classes of citizens (minors, felons, physically disabled, etc.). Note also that Congress has historically excluded certain occupations from militia service (harbor pilots, etc.). J. Stevens's _Heller_ dissent claims -- without citing a single case -- that the states have a positive right to define militia enrollment. If J. Stevens were right, then each state could define its own State Guard enrollment, and the "unconstitutional conditions" doctrine should prevent the feds from withhholding Nat. Guard funding. Federal funding generally cannot be made conditional on the surrender of a constitutional right. It would be an interesting test case if a state were to reject conformance with Nat. Guard requirements, but demand federal funding. In reading this post, I can’t help but think about the linkage of culture and politics and how far we’ve wandered from the path that our Founding Fathers blazed for us. Politics usually follows the culture and in nations like Switzerland and Israel where citizenship is strongly linked with military service there is respect for the “gun culture” and self-defense. Likewise in America, the politics of gun rights follows the culture. Patrick Henry said, “the great object is that every man be armed…” However, contemporary American culture has gotten far from this “great object” that is better exemplified by the Swiss and Israelis. Now, American culture, particularly pop-culture, regularly treats the armed citizen as an eccentric or a Bambi killer or a paranoid narcissist. Although it’s a rare example of an American community following our Founding principles, Kennesaw, Georgia is often seen as an aberrant community. Its low crime rate is just a coincidence. Perhaps, the next great challenge for the RKBA movement is to re-link citizenship and the responsible and regular exercise of our 2nd Amendment rights. Gun rights can’t be just a “rural thing” or “something my Grandpa in Idaho does.” Although, I’m not in favor of a military draft, at least in the way most Americans understand it. Maybe, there is a way to systematize the Kennesaw, Georgia experience, give some organization to the “unorganized militia.” It can be taken nationwide as a counter to the anti-gun rights movement and reintroduce many Americans to their 2nd Amendment. The problem is that such an organization needs to have been built by the 1960's. Sadly, attempting to build such an NGO today would be very problematic. I have discussed this type of organization numerous times with friends and acquaintances. I'm just not sure that it can be done without being demonized by the press and destroyed by law enforcement. For some context, let's see if we can fit a historical situation onto today's facts. Yeah, it won't be perfect, but let's do the thought experiment. Let's say the our current government fails to perform one of it's fundamental duties. In Pennsylvania in the mid 1700s the Quaker dominated state government failed to protect the citizens from attacks by native americans. Today, our federal government fails to allocate sufficient resources to close our borders. Back then, a private citizen organizes armed groups to protect the populace, backed by one of the most prominent writers and publishers of his day. Today, unarmed Minutemen volunteers are vilified as extremist hate-mongers by the press. As far as I am concerned Will Shakespeare had it right in Henry V.